I was recently given the opportunity to test out the new Leica Disto D810 Touch – a hand held laser distance metre complete with a touch screen and on-board digital camera. Although I have previous experience with the older Leica Disto A5, it it was a good to get my hands on the new model. As with most other laser metres, the Disto D810 Touch allows for the take-off of straight-line measurements and can generate a number of indirect calculations such as area, volume and hypotenuse. The device is able to measure up to a distance of 660’ with accuracy of 1/16”, suitable for pretty much any landscape architect’s requirements. It also features an on-board camera that allows you to take a photo of an object and measure its dimensions using the touch screen on the device itself. This point and shoot functionality calculates the depth of field in an image and enables real world measurements to be taken from the photos you snap. The device’s inclination tracking, Smart Horizontal, ensures the accuracy of indirect calculations and photo measuring. It also allows you to measure the distance of an object even when the perpendicular line of sight is obscured. The touch screen is a world first for laser distance metres, and although it’s not quite as quick to navigate through as on a smartphone, it makes menu navigation much easier to use than on previous models. Leica has also developed the Disto Sketch smartphone app, which allows dimensions to be quickly and wirelessly added to photos, sketches and excel spreadsheets. This allows for quick and accurate on-site takeoffs. Most of my professional work takes place in the public arena and as such I am often provided with site survey drawings, but I can definitely imagine that landscape architects involved in residential work could save plenty of time using the Disto D810 Touch. That being said, I took to the backyard in a ‘faux project’, looking to replicate what a landscape architect may do at the beginning of a residential engagement. I found that I was able to quickly and easily produce a dimensioned sketch plan for my yard using the Disto Sketch smartphone app. One more neat trick I found with the new product was its ‘minimum/maximum mode’, which produces a smart little workaround for human error in the measuring process. All you do is run the laser in an arc shape through your furthest point of measure and it will detect that furthest point and record it as the measurement. I found this useful when measuring irregular corners of my site. Now, I can imagine some people might be put off by the $849 USD price tag, but if you often find yourself taking on-site measurements then a workflow that combines the Disto D810 Touch with the Disto Sketch smartphone app could save you an hour or two each project. Furthermore, particularly in the case of a D&C firm, the on-site team could measure particular site areas/elements and wirelessly transfer these to the office-based design team, potentially removing the need for additional site visits later in the project. When you consider the cumulative effect of this saving, maybe the price tag is a little easier to digest? All-in-all, considering the vast improvement on the older model that we’ve got in our office and Leica’s effort to move to a more streamlined digital process, it was a positive experience with the new Leica Disto D810 Touch. Jason Packenham is a Registered Landscape Architect at Context and design studio tutor in the Bachelor of Landscape Architecture program at the University of New South Wales. Rhinoceros (Rhino for short) is a standalone 3D modelling program that provides a flexible and versatile modelling environment for a variety of architecture, engineering and construction (AEC) industry professionals, from architects to industrial designers; including landscape architects! Its interoperability, multidisciplinary toolsets, relatively low learning curve (compared to other high-end 3D modellers/renderers) and modest price tag make it quite an attractive option for those looking to incorporate 3D modelling within their design, documentation and presentation workflows. What makes Rhino’s modelling capabilities so robust is its use of NURBS geometry. What are NURBS you ask? NURBS (Non-Uniform Rational B-Splines) are mathematical representations of 3D geometry that can accurately describe any shape, from a simple 2D line or curve to the most complex 3D organic free-form surface, solid or mesh. Because of their flexibility and accuracy, NURBS models can be used in any process from illustrative representation to fabrication. The beauty of NURBS is that less information is required to model a piece of geometry than the amount of information required to model the same piece of geometry using faceted approximations. A good explanation of this above point is illustrated in the following image. Here, we have a faceted SketchUp arc (left) and a smooth Rhino arc (right). An arc drawn in SketchUp (left) and Rhino (right). The faceted curve is made up of a number of straight lines – the example above includes eight lines. Sure, this number can be increased, but doing so increases the amount of information required to model the geometry of the curve, and the accumulative effect of this increase in information is poorer hardware performance. The basics of modelling in Rhino: Points, Curves, Surfaces and Solids. Rhino’s interface allows for multiple views of your model, using viewports that can represent orthogonal and perspective views simultaneously. This allows for accurate orthogonal drafting in plan and elevation views, similar to what you would experience in conventional CAD programs, with the ability to see and switch to your perspective view for a 3D modelling process similar to SketchUp. This also allows you to appreciate what your documentation drawings will look like as you go. Multiple viewports allows for an accurate yet dynamic modelling workflow. Another fantastic use of Rhino comes with the Lands Design plugin, which offers a number of landscape-specific palettes containing tools for landscape professionals. The terrain tools include the ability to produce a digital terrain model (DTM) as well as import Google Earth terrain and imagery directly into your modelling space, which is great for adding context to your work. Plant tools include BIM enabling plant objects, viewable in 2D entourage in plan and elevation views as well as 3D models for perspective views. These plant objects are linked to a plant database that allows for scheduling of plants for your planting plans. Existing plant models can be modified or new plant models created using the Plant Editor, with everything from growth habit to trunk bark and foliage completely customisable. The plugin also includes a civil palette with path, stairs, walls and fences tools, while other tool palettes include irrigation, urban furniture and documentation. Parametric modelling involves the use of parameters and constraints to define the model. Parameters may include dimensions, materials, object assembly points, etc while constraints applied to these parameters can affect their behaviour, for example the width of a retaining wall remaining a particular dimension. There will be a more in-depth look at parametric modelling for landscape architecture using Rhino and Grasshopper in a follow up post by fellow Land8 writer Adam Mekies – an article I’m very much looking forward to! For me, Rhino sits between the entry-level modeller SketchUp and more advanced rendering programs such as Autodesk’s 3Ds Max. The program enables 2D orthogonal drafting in much the same way that AutoCAD does and combines this with simple surface and solid functions similar to those in SketchUp. I’ve once heard of it described as SketchUp on steroids – and I’d have to agree. If you are looking for an affordable and robust modelling program that offers more than SketchUp but doesn’t commit you to the often-daunting learning curve of advanced modelling and rendering programs, then Rhino is for you. 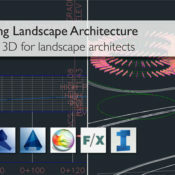 It has a mind-boggling number of useful features and plugins that enable you to do just about anything, and it’s always nice when some of these cater specifically for us landscape architects. 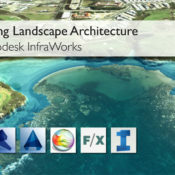 Today in the Digitising Landscape Architecture series we’re going to talk about Land F/X: a landscape-specific, BIM-enabling add on program that works entirely within the AutoCAD environment and is growing ever-popular with landscape architects around the world. The program automates numerous tasks associated within planting, irrigation and hardscape works to streamline your workflow. Land F/X’s +20,000 plant database is a constantly growing resource, with new plants created by other users provided to the entire Land F/X community. Each plant that you select from this database can then be assigned a symbol either from Land F/X’s library of over 1,000 blocks, or from your personal collection. Plants can even be assigned to hatches for quick area-based calculations. Plant labelling and scheduling can also be generated quickly and with ease. The Land F/X also offers SketchUp Connection, a free and neat SketchUp plugin that allows users to import and export seamlessly between AutoCAD and SketchUp. 2D plant and site furnishing symbols from Land F/X’s CAD library are automatically translated into 3D models within SketchUp. Not dissimilar to my discussion of BIM in article #2 of this series The BIM Revolution, I think Jeremiah’s response to the word as being ‘over-used’ is perhaps the result of its broad definition. Farmer also divulged future plans to incorporate a COBie file translator, aimed at addressing the UK Government’s BIM mandate, so that Land F/X’s UK clients can keep up with the compulsory rollout for BIM within the UK’s public sector construction projects. It’s also something worth keeping an eye on in relation to the BIM revolution, and how it affects the work of landscape architects elsewhere. 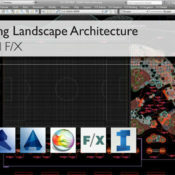 If I’ve peaked your interest in the software, educational and trial versions of Land F/X are available via their website, as are webinars on everything from CAD basics to mastering the planting tools. As usual, be sure to let us know how you go! A big thank you to Jeremiah Farmer for his time! This article is part of the Digitising Landscape Architecture series. Click here to view other articles in the series. 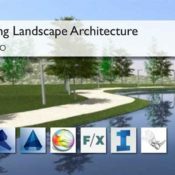 Although Autodesk appears to favor the architecture, engineering and construction (AEC) industry over landscape-specific capabilities, there are a number–my guess is that this is relatively small–of landscape architects that do successfully work with Revit. One of the major benefits of doing so is the ability to more closely collaborate with other professions of the AEC industry who also work with Revit. In addition to a more streamlined workflow, there are also additional ways that Revit can be applied to the work of a landscape architect. Most of these benefits are related to the modelling of exterior site design elements such as retaining walls, areas of paving, site fixtures such as fences, handrails, seating and so on. Associated with these parametric objects is a database of information that can be used for detailing, quantity take-offs, procurement, future maintenance requirements, etc. Plus, since the workflow of Revit is centred on the creation of a virtual 3D model of your design, amendments made to this design can be carried across multiple drawings (plans, sections, 3D views), which leads to greater work efficiency. For instance, Revit’s Toposurface tool allows for the creation of a 3D terrain model. A basic Toposurface is usually created by either placing spot levels yourself or by importing 3D terrain data from another drawing. Terrain information from Google Earth can be incorporated within your Revit model by importing the terrain into SketchUp and exporting this to .dwg. I recently spoke with Lauren Schmidt, landscape architect, Revit user and BIM blogger, about how her experience with the program. Jason Packenham (JP) – What type of landscape architecture work are you typically involved in? Lauren Schmidt (LS) – As a part of an architecture/engineering firm, most of the projects I work on are sites that are focused around a building. Those projects range from K-12 schools, higher education, corporate offices, to urban infill development. We also work on more traditional landscape architecture work, such as parks, trails, and master plans. JP – Given the hesitance by many landscape architects to make the switch to Revit, what influenced your decision to do so? LS – Well, it was actually an idea that originated from architecture. They have been working in Revit for about 6 years – all of the other building-oriented disciplines; interiors, mechanical, electrical, and plumbing, work entirely in Revit. Only our civil engineers and landscape architects still work in AutoCAD. The tipping point happened 2 years ago. Most of our office was working on a large, complex high school project. We found that the landscape was being drawn repeatedly and in too many places; plans in AutoCAD, 3D model in SketchUp, sections drafted in AutoCAD, and yet a Revit model was still created so the other disciplines could visualize and coordinate with the landscape. Consolidating all of that into Revit just made sense. JP – With Revit being oriented predominantly towards architects, what ‘landscape’ and BIM features does the program offer? And how do you use these features within your projects? LS – I will be the first to admit that Revit is not perfect for creating landscapes. What is often the most useful are the standard BIM features, like the ability to schedule and tag “smart” objects; planting schedules, plan notes, and cost estimates require almost no effort. But the simplest and best feature is having an accurate 3D model that is also driving your construction documents. JP – How has adopting Revit influenced how you collaborate with other architecture, engineering and construction industry professionals? LS – With the landscape in Revit, collaboration with architecture and engineering is on an entirely different level. I have their ‘live’ model linked directly into the landscape model and vice versa – and as these projects move into construction, contractors are asking for these BIM models for cost estimating, clash detection, and construction sequencing. Eventually, BIM will be industry standard, because anything less won’t be worth it. Can Revit Boost Interdisciplinary Collaboration? For a better idea of how Revit can aid collaboration with other AEC industry professionals, I also spoke with Lachlan Stanton, Architect at Drum Rose Architects, based in Sydney, Australia. I asked him about the advantages of collaborating with landscape architects using Revit instead of 2D CAD alternatives. “I guess one of the biggest factors is the ability to collaborate in 3D. Revit’s ‘Central Model’ allows for multiple people to work on different elements of the model whilst compiling all the information into one central model. This means that a landscape architect could model exterior design elements such as topography and vegetation while the architect sticks to the building. As the project progresses, the Central Model would build into a complete model. This would save the need to have multiple drawings, and to be constantly sending updated plans back and forth. 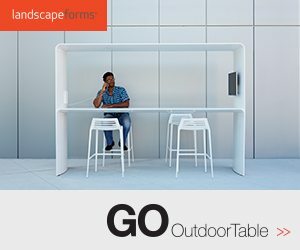 With this being said, standalone Revit doesn’t offer a landscape architect the same site-design and landscape capabilities that other programs do. However, Eagle Point’s add-on programs Siteworks and LANDCADD can increase the landscape-specific functionality of Revit. Eagle Point’s products offer landscape architects the ability to shape terrain using grading tools to model pads, parking lots, streets, sidewalks and retaining walls. LANDCADD also enables the locating of trees, shrubs and groundcovers into the model, which are associated with a large database of searchable plants. You are also able to lay out other landscaping features, such as paths, plazas or parking areas and obtain areas or take-off materials. Pushback Against Revit in Landscape Architecture — Is it Worth the Investment? A part of me gets the feeling that the presence of Revit within a small portion of the landscape architecture profession is probably due to the pressure for landscape architects to collaborate with architects and other professionals already using the program. This then raises an important point for landscape architecture firms where collaboration with other professionals using Revit isn’t a priority. Revit wasn’t really made for us landscape architects, and despite anecdotal evidence of its success for some, it’s hard to recommend it. Although there are additional add-on programs available for Revit that are oriented towards landscape architects, I think we are still a fair way off Revit offering a comprehensive option for a landscape architecture firm to justify the cash and time investment. A big thank you to Lauren Schmidt and Lachlan Stanton for their input to this article! This article is part of the Digitising Landscape Architecture series. Click here to view other articles in the series. With the increased prevalence of BIM in the architecture, engineering and construction (AEC) industry, there has been ongoing debate within the profession of landscape architecture regarding the need to adopt BIM workflows. Depending on who you ask, the definition of BIM tends to differ. For example, in ASLA’s LATIS 2008 paper Integrating BIM Technology into Landscape Architecture (Sipes, 2008), BIM is discussed as a form of 3D modelling with intelligent data attached to the modelled ‘objects’; much of its discussion revolves around the process of modelling. On the other hand, the Landscape Institute has taken the position that BIM is more about the process of sharing information (Slavid, 2014). 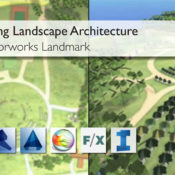 The Landscape Institute also says the term ‘Building Information Modelling’ js complicated by the fact that the word ‘building’ is a verb, and so the acronym could be interpreted as ‘To Build an Information Model’, with the model potentially containing much more information than that related to a building. This information includes all data relating to design, costing, build-ability, clash detection, scheduling and procurement, sustainability impact, life cycle and facilities management factors (What is BIM?, 2014). For the landscape architect, BIM can help transform a tree symbol in 2D CAD from a bundle of polylines and hatches into an intelligent tree ‘object.’ The smart tree object is now documented in a database for easy scheduling, procurement, costing, maintenance requirements and so on. Not only do we know it’s a tree, the tree “knows” it’s a tree and can offer up its height, width, whole-of-life performance information, sustainability impact, etc. without us inputing or knowing that information beforehand. Most importantly though, BIM offers an integrated process built on coordinating and streamlining information about a project from design through construction and into operations and maintenance. Depending on your project needs, there are now several programs available that can help with collating these databases of information in association with BIM ‘objects’. As a result, the integrated information in BIM can increase efficiency and even minimize user error in workflows. A parametric object can now store libraries of information and create easy access to up-to-date detailing, quantity take-offs, procurement, future maintenance requirements, etc. Once amendments are made across multiple drawings (plans, sections, models), the quantity and types of certain objects will also be automatically updated and eliminate the need to manually count and record the changes. When modeling the ‘smart’ tree, we are building information into the project model with the ultimate aim of creating coordinated, reliable information for all stages of a project’s life-cycle and facilitating true collaboration within the project team. What does BIM mean for landscape architects? First and foremost, don’t rush into committing to a particular software package believing it will be the all-in-one answer you’ve been waiting for. Over the years, popular CAD programs have been tailored much more to the remainder of the AEC industry than to landscape architects. The current state of the BIM revolution would suggest this trend is likely to continue, at least with mainstream developers such as Autodesk and Bentley. That doesn’t mean landscape architects won’t get a say, however. My advice is to stay tuned to those already engaged in the BIM revolution. The Landscape Institute is proactively involved in ensuring that the requirements of landscape architecture are considered as the UK’s AEC industry moves towards compulsory BIM project deliverables. They have a wealth of information available on their website. For anyone with the time, I would also recommend reviewing ASLA’s LATIS 2008 paper Integrating BIM Technology into Landscape Architecture. Furthermore, stay tuned to the ‘big players’ in the BIM game – Autodesk, Nemetschek, Land F/X, Eagle Point, amongst some others. As already mentioned in the introductory article to this series, what landscape architects ‘do’ can vary so significantly that finding one particular program to suit all of our needs is highly unlikely, so engage with all your options. The BIM world is a business after all, and if landscape architects express their interest and need, business-savvy developers will be sure to fill the BIM gap. To learn more about BIM in landscape architecture, stay tuned to the Digitising Landscape Architecture series, as we explore some of the more popular BIM-enabling programs used by landscape architects. Sipes, J. L. (2008). LATIS – Integrating BIM Technology into Landscape Architecture. Washington DC: American Society of Landscape Architects. Slavid, R. (2014). 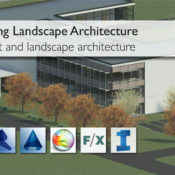 BIM for Landscape. Landscape.